Thanks to RIck Etkin for another great shot! Having lived in the Downtown Eastside of Vancouver for over a decade I have seen a lot of money thrown at dealing with poverty, addiction and homelessness over the years. The fact is, money can’t fix everything. I came up with the idea to package heirloom seeds in a wonderful container using historical botanical illustrations that capture the feel of early Vancouver. My vision was to create collections of seeds that people with little or even no yard could grow in order to produce a portion of the food they eat. This would cut down on our carbon foot print as well connect people with the very nature of what they eat. I also find gardening good for my mental well being. With the help of some very knowledgable people, who have been in the seed and nursery industry for over fourty years, we put together collections of non-gmo, untreated seeds for container gardens on urban balconies, roof top gardens and window boxes. Our unique collections offer more than just seeds. Every collection has been designed with purpose in mind. For instance our Salad Sampler No. 1 has all the seeds you need to grow fabulous salad ingredients as well as a recipe, growing instructions and germination information. Our Kids Starter Seeds are a great way to get kids interested in gardening. They contain a four kinds of seeds (from the smallest to the largest): Red Runner Beans (a kid classic), Dwarf Sunflowers, Rainbow Carrots (four colourful carrot varieties) and mint (kids love to pick off leaves to eat!). We also offer a herb collection and a larger Urban Salad collection. But perhaps the best introduction to gardening for people living in small urban spaces is our microgreens. We offer both a microgreen kit which has a coir madeof organic prairie grasses for the microgreens to grow on or just the seeds, which are a slightly spicy blend for good flavour in sandwiches salads, or just on their own. Even better, you can grow these indoors, any time of the year. I like to experiment with different wasy to grow them. A couple of my favorites are a seashell, walnut shell and a thimble. The thimble and walnut do require special care as there is so little soil that they need frequent watering. All our collections come with a little something extra such as a recipe or instructions for a garden project. 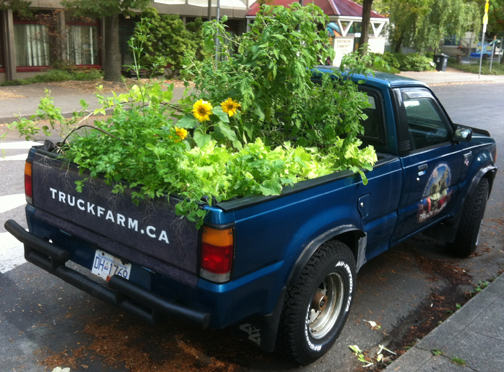 In fact we even included instructions for how to build your own truckfarm. Proceeds from sales of our unique collections of seeds help create new jobs in the Downtown Eastside as well as help develop sustainable food growing programs at Vancouver’s inner city schools, daycares and community centres. Job creation is focussed primarily on youth, single parents and people living on disability. You can find them all at http://www.strathcona1890.com or at the retailers listed listed on our site. 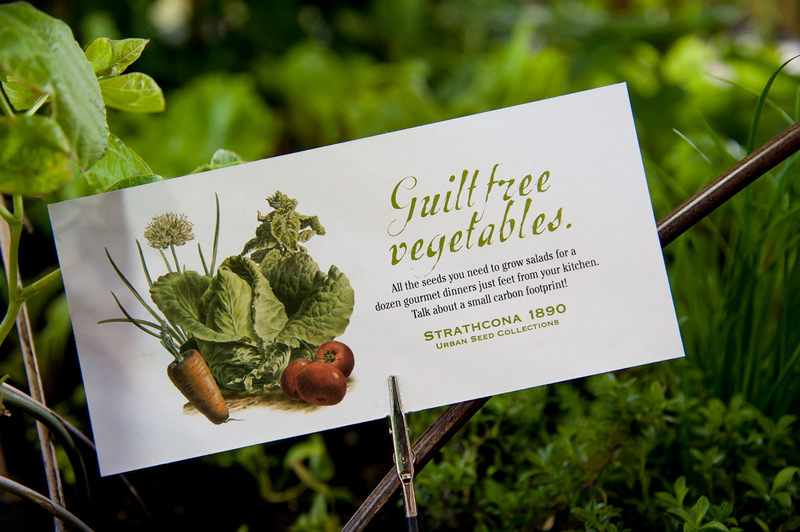 Strathcona 1890 is dedicated to promoting positive change, one seed at a time. Just saw this on PBS and made me so happy! Proud of you. I am disabled and find gardening and seed collecting therapeutic. Wish I were in CA. Gardening is harder in PA. But I still try! Thank you for your contribution for a better Earth and society. Thank you so much 🙂 I am very aware of how therapeutic gardening is, physical contact with the earth is so important. I wanted to build a garden for physically challenged people in Vancouver but I am afraid some significant life changes have delayed that. Best of luck to you. Watching you on Create TV in the US now. You are doing a WORLD of good. Here in NYC it’s hard to garden, but we are a lot of immigrants from heavily agricultural places (Asia, Italy, Ireland, etc) and every thin strip of soil, roofs, fire escapes, tiny cement yards with buckets here is used for hardy veggies and herbs. It’s the highlight of our year, our tiny harvest. Keep on keeping on, you’re planting more than just seeds. I saw this on PBS and was inspired by your beauty and energy. The drive you have teaching people a creative way to a healthy sustainable lifestyle is amazing. Thank you for sharing a glimpse inside your day to day life. If I was single and lived anywhere close to BC then I would ask you out. I think you are gorgeous and your energy is down to earth. I’m not a weirdo either, just a 40 yr old hippy. Haha, you made my day. Growing Chefs’ Favourite Things « Growing Chefs!